MDeyes was formulated in response to research into eye health through nutritional supplementation. Based on recent scientific research, MDeyes delivers a complete macular health formula in a simple ONCE DAILY dosage. Everybody produces free radicals every day – they are generated within the body through a variety of mechanisms. Antioxidants act as ‘free radical scavengers’, and many free radicals are taken care of by the body’s own free radical antioxidant defences. However, there are some free radicals that elude these defences, resulting in cellular damage. Research suggests that free radical cellular damage can accumulate over time. Antioxidants such as Zinc and Vitamins C and E, can assist in protecting from free radical and oxidative damage. found in the macular area of the retina. In the macula, Lutein and Zeaxanthin naturally form a layer called the macular pigments and filter high-energy blue light. Higher macular pigment density is associated with healthier eyes and supporting visual sensitivity. 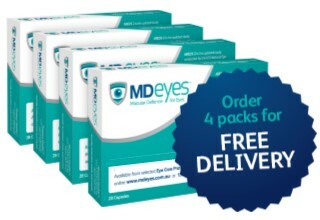 MDeyes Once Daily Capsules: Adults – Take 1 capsule per day, with or just after food, or as professionally prescribed. 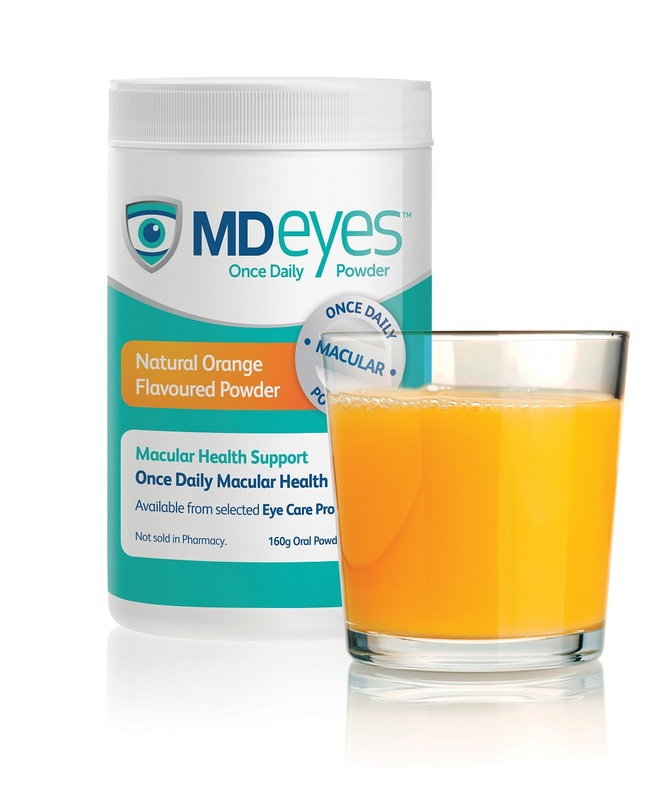 MDeyes Once Daily Powder: Adults – Take 1 scoop (4g) of powder per day, with or just after food, or as professionally prescribed. 4g measuring scoop included inside tub. Mix 1 scoop of powder with approximately 1/2 cup of water (note: the amount of water can be varied according to your personal preference). Each pack of MDeyes Once Daily Capsules contains 28 soft gel capsules. Physical Description - Brown Soft Gel Capsules packed in 2 x calendar-labelled blister foils with 14 capsules in each blister (4 weeks per pack). Each tub of MDeyes Once Daily Powder (160g) contains 40 x 4g serves. Physical Description - Free flowing, off white powder with mottled orange coloured speckles and natural orange flavour, presented in a white tub with 4g scoop. Powder dissolves in water to make a pleasant tasting orange drink. 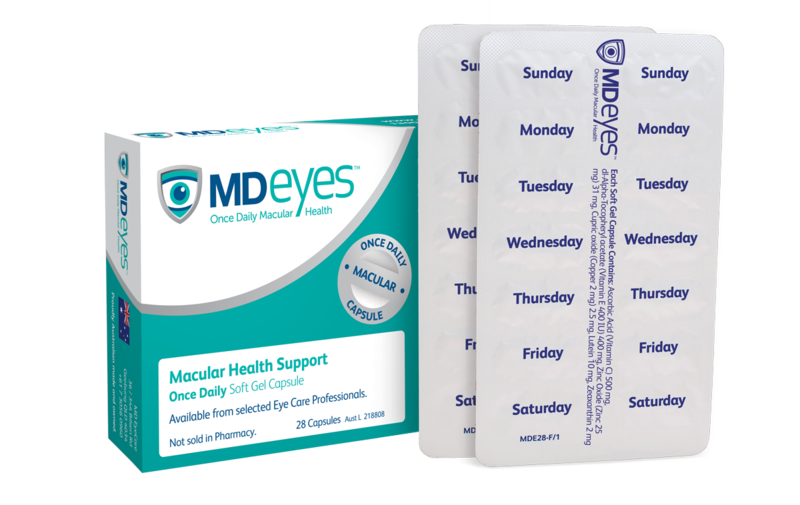 MDeyes' innovative packaging helps you receive the supplement's full benefits, by helping you remember your daily capsule. Calendar labelling on the blister foil and the unique tracking grid on the back of the pack help to ensure your daily dosage compliance. MDeyes Once Daily Powder is ideal if you'd rather not swallow a capsule. The 4g measuring scoop inside the tub helps ensure you receive the correct once daily dosage each day. With all supplements there is always a possibility that individuals may be intolerant to specific ingredients. Consult your Eye Care Professional or Medical Practitioner, if you have any concerns. ®FloraGLO is a registered trademark of Kemin Industries, Inc. and OPTISHARP® is a trademark of DSM. In Australia, the maximum recommended daily dose of Zinc in a listed (non-prescription) medicine must not provide more than 50mg of Zinc/day. Zinc supplementation greater than 25mg/day but less than or equal to 50mg/day requires appropriately labelled cautions (Schedule 4, Poisons Standard 2013. SUSMP No. 4).